This decorative Birch tree can bring nature's beauty into your home or office. Each tree is hand-painted with realistic bark details and may even accessorized with ornaments if desired. The Birch tree features 24 independent white glowing LED lights as well as a sturdy base which could be placed in a decorative pot. A built in timer turns the tree off after 4 hours of use and automatically powers back on 20 hours later. 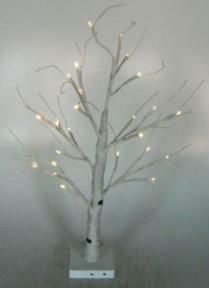 Artificial LED White Birch Tree, measures 2 feet tall. Branches are flexible to form to your liking. Battery power option for clean appearance, 3 AA batteries included.